Character. Cost: 3. STR: 2. 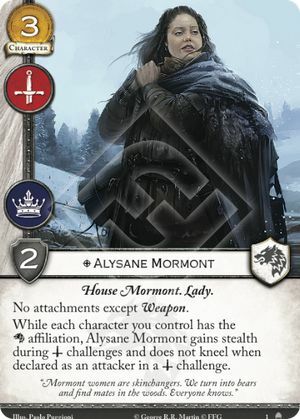 While each character you control has the affiliation, Alysane Mormont gains stealth during challenges and does not kneel when declared as an attacker in a challenge. "Mormont women are skinchangers. We turn into bears and find mates in the woods. Everyone knows."